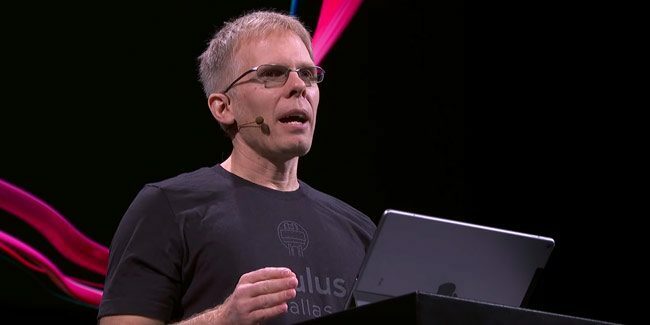 During his trademark unscripted keynote at OC5 this week, Oculus CTO John Carmack covered a wide range of topics, including the company’s upcoming standalone VR headset, Oculus Quest, revealing that technically the headset is on par with last generation consoles—the Xbox 360 or PlayStation 3. Carmack did, however, point out that even though Oculus Quest, which is powered by a Qualcomm Snapdragon 835 SoC, has roughly around the same raw processing power of the previous console generation, it doesn’t mean that the standalone headset can render high-resolution VR content that is comparable to a AAA title on Xbox 360 or PS3. Most games of that console generation, Carmack said, rendered graphics targeted at 1280×720 at 30fps. While in virtual reality, rendering is targeted at 1280×1280, twice for stereo, and at 72fps. Ultimately, that’s 8.5 times as many pixels than on an Xbox 360 game, plus the addition of high-end anti-aliasing and texture filtering needed for VR content as well. According to Carmack, Oculus Quest has far more texture memory and main memory in general than any of those last-gen consoles. As a result, some of the development can be easier on Quest, and in many cases, Carmack says, developers will be able to “trade really rich textures for complex shaders and multi-pass rendering” in various ways. While the Oculus Quest may or may not deliver close to the graphical performance of what is seen on a high-end PC VR today, Carmack believes in no way does that impact the immersive Rift-like experience that the Quest can deliver. “I do stand by the statement that I made that the core magic of any Rift experience can be brought to [Quest], but you can’t ignore the level of processing power differences. A big high-end PC can use up to 500 watts of power” Carmack explained, noting that the Quest is using approximately 5 watts of power. “There’s almost a factor of 100 difference in total power…” between the two headsets. If the Oculus Quest plans to compete with the Switch, it’s certainly going to need plenty of compelling and immersive content to entice gamers. Oculus says that the Quest will have over 50 titles and more on the way when it launches in Spring 2019 for $399.